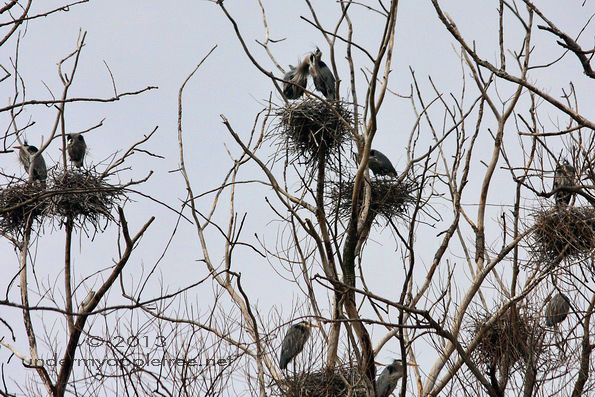 Great Blue Herons usually nest in colonies with multiple nests per tree. A colony can have only a few or hundreds of nests. There are two rookeries in my area and I stopped by each of them to see what the birds were up to. Nests are constructed of sticks which are collected by the male and woven together by the female. She then lines the nest cup with with pine needles, moss, reeds, dry grass, leaves, or small twigs. It can take up to two weeks to build the nest. When complete they are about 2 feet across and can be as large as 4 feet across and 3 feet deep. The female will lay from 2 to 6 eggs which will hatch in about 4 weeks. Nestlings will remain in the nest for about 2 months. 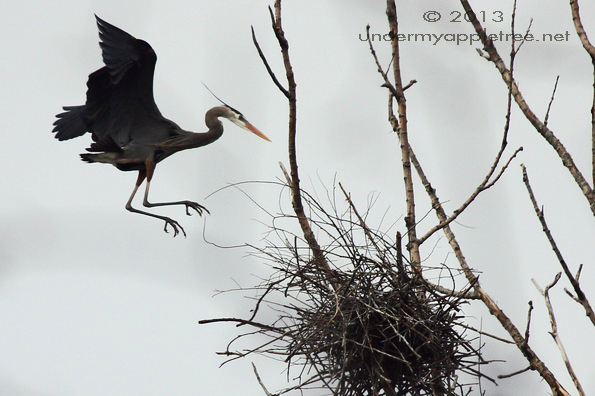 This is the perfect time to observe the nests. Once the leaves are on the trees it becomes difficult to see them. Wonderful pics, Leslie! The last one looks like an Audubon print. What a wonderful sight that must be! Three lovely pictures- I especially like that last one- magnificent birds in breeding plumage. WOWOWOWOWOW how fantastic! I’d love to see them. It’s kind of funny to see such big majestic birds in trees. Your photos are fabulous!! They are very graceful but look almost prehistoric when they are flying. That second shot, with the bird in stark outline against the sky, is gorgeous! I can see it in a frame. Thanks. I would have preferred a blue sky but nature wouldn’t cooperate. These are amazing photos. From where I live, here in the foothills of the Rocky Mountains in Alberta, you can see why these are rare sights for me. I’ll need to go out to the west coast, Vancouver, to see a GBH. Thanks for sharing these wonderful pictures. If you get the opportunity to visit a rookery it’s worth the trip. 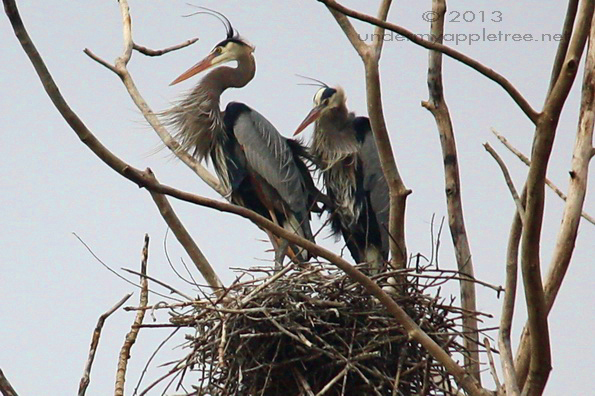 We watched them gathering sticks and bringing them to the nest for an hour… fascinating. I woudl love to see this – the nest sounds huge and the babies stay for 2 months??? WOW! The parents bring them fish. And those babies get big, almost the size of the adults before they leave the nest and learn to find their own food. Oh my! These take my breath away! Beautiful. Oh my word, those are gorgeous images!! Leslie, where is this local place?? Love the shot of the heron landing. Wow, how amazing to see the Heron up close, beautiful photos! Great Photos, what a wonderful site. These pictures are so beautiful! Have a lovely Easter. ah I think I found it: Almond Marsh near Grayslake? No, more local than that. These herons are at Danada in Wheaton. I’m not just making this up on the spot, but the blue heron is my favorite bird. I also like toucans. The former because they are so stately and elegant. The latter because they are so wonderfully ridiculous looking. I like the Toucans too. One of these days I hope to see one in person. I’ve never seen so many herons together! We have them (although I’m not sure exactly which kind, they look similar) but I never knew they’d nest in colonies! Very nice pictures. Europe has the Grey Heron, which is closely related to our Great Blue and looks similar. They also breed in colonies near water. As you might know, we have lots of water, so I guess they find spots as far away from civilization as possible (although in the Netherlands that is never far). At least, I’ve never seen more than 2 or 3 herons within the same area. And no nests, either. I just found out about this large one a few weeks ago and I’ve lived in this area for years. It’s in the middle of a forest preserve and can’t be seen from the road. It’s also in a swampy area surrounded by lots of trees. In the next few months it won’t be visible even to those who know where it is. Clever birds! Wow! What great photos. Thanks for sharing these.